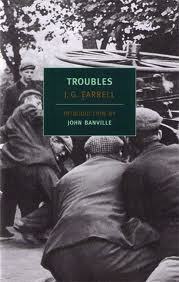 Farrell is an under-appreciated genius in my opinion, and it’s especially apparent in this sad yet humorous award-winning novel about the time of “Troubles” in Ireland circa 1919-1921 with a larger view to the collapse of the entire British Empire. This is his first novel in the Empire series – (not a trilogy, joined by theme). On the surface, this is the story of an English war veteran, Major Brendan Archer, returned from the trenches and off to Kilnalough, a small fictional town, to meet the family of his supposed fiancé, Angela Spencer. The Anglo-Irish Angela lives with her father, Edward, in an old and rambling but dilapidated seaside hotel called the Majestic along with a few hanger-on guests and assorted servants. Edward owns the once upscale Majestic and some surrounding land complete with a largish and overgrown apple orchard and a few tenants. Angela dies not too long into the story, but Brendan stays on, finding himself attracted to Sarah, a neighbor and obligated in some way to Edward. His only relative, an aunt in London also dies so Brendon has no other family. 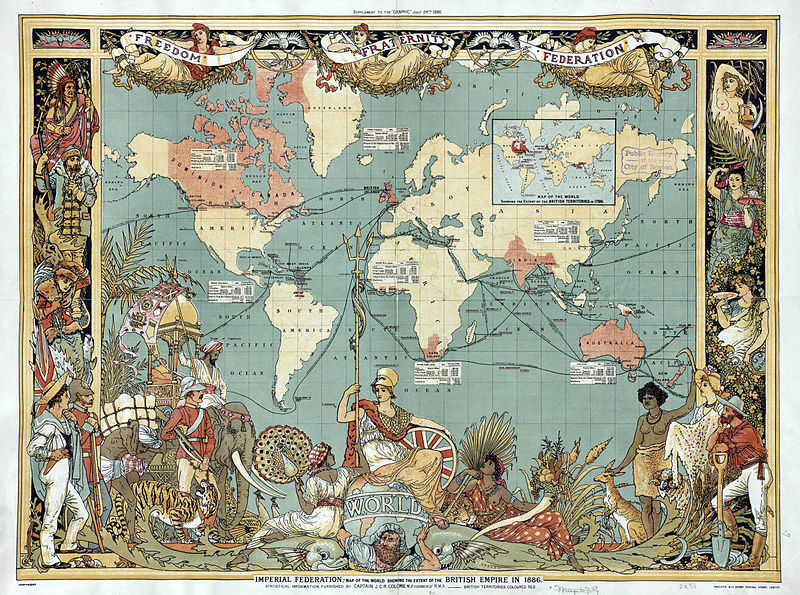 Meanwhile, Forrester has inserted historically based news articles about “troubles” England is having elsewhere in its far-flung aging empire, in India and South Africa, in Mesopotamia and Cairo. The writing about the Majestic Hotel is languid, sumptuous, visual, and quite often funny. But what is interesting about Farrell’s writing is the manner in which he inserts the other historical events into the narrative. The historical minutia in the main narrative is all verifiable with a little googling – I was amazed. But there are troubles at the Majestic, too, this aging and untended Eden, troubles with money and loyalty to the King as well as some light romance. Long standing ehnic and religious conflicts have come to a boil. The Sinn-Fein, the Irish Nationalist party, are readying themselves to fight the Brits for the independence declared in 1916. The Spencers, but decidedly not all the guests, are fiercely loyal to Britain and her king but the servants and the tenant peasants and many neighbors are definitely not. The characters are, for the most part, well defined and mostly quite sympathetic, quirky in their own ways. The protagonist, Brendan Archer, is difficult to fathom – the reader gets only rare glimpses into what he thinks about it all – the family is “mad,” in his opinion. And he is English therefore anti-Sinn Fein. He wants to leave but he’s apparently stuck at the Majestic for some reason. The genius lies in the metaphor, the satire, the parody which are deeply imbedded throughout the novel but never take over. Troubles is first and foremost a righteously good yarn with complex and “troubled” characters who are rounded in their own right. First, of course, the Majestic is a thoroughly clever, amusing and intelligent metaphor for the sprawling, crumbling, almost mystifying English Empire of Post-WWI. The protagonist, almost always called “the Major,” is the typical Post-War non-military (he retired) Englishman in Ireland, or in relation to Ireland / Troubled England in which the Empire is no longer viable. He may be “typical” but he’s not a type – perhaps he’s called “Major” throughout to emphasize the idea of typical. Meanwhile the older Spencers, Edward and Angela, are strictly old Anglo-Ireland Protestant, with tea, balls and a stiff upper lip, etc. Edward is actually like a little personification of old England and he comes to want Ireland (Sarah) whether she’s Catholic or not – but that’s a darn shame she’s a Papist. When Edward’s son, Ripon, wants to marry a Catholic girl it’s an abomination. For the Major, who is English and Protestant and now resides in Ireland, it’s Angela (Prots) vs then Sarah (Caths) but Angela (Cath) dies and Sarah is more interested in Edward but that changes. So the Major is in the middle – English but no longer interested in Empire due to the crumbling and decay and too much bloodshed – (not really interested in the crumbling and decaying Majestic). He’s inherited that Empire in a sort of illegitimate way, doesn’t really want it – too much trouble. Nevertheless, he has a serious fondness for the new Ireland – Sarah. Throughout the book the Irish War of Independence is building with Sinn Fein and others using guerrilla tactics against the Brits who are becoming more and more nervous. Edward loses his senses, the old ladies at the Majestic try to meet the challenge, the plot has been building ever so slowly until the end where it really all does come together in a hugely suspenseful and page-turning series of events. Highly recommended – and I’m going to see about getting ahold of Singapore Grip, too – the third book in Farrell’s Empire trilogy. Major Brendon Archer – bitter and confused, a retired WWI English soldier now in Ireland. I didn’t realize that there was an empire trilogy. I read The Siege of Krishnapur a few years ago and enjoyed it (it won the Booker in 1973). I assume that it’s part of the same trilogy. I’ve read The Siege of Krishnapur and Troubles, and I loved them too. I think they’re wise books that dig below the stereotypes and make the reader think of many different PoVs. Somewhere in my teetering TBR there is also The Singapore Grip, which I am kind-of saving for when I’ve had a run of not-so-enjoyable books and need to read something I *know* I will love.